US Representative Susan Davis came to visit QFS to see a technical demonstration and learn about some of our work. Rep. Davis sits on the House Armed Services Committee and was interested to see how QFS is contributing to the Department of Defense. The picture shows Rep. Davis with QFS CEO Dr. Yongming Zhang in our lobby. As part of his outreach to successful high tech companies in his district, Congressman Scott Peters came to QFS to learn a little about our work and offer an expression of support. 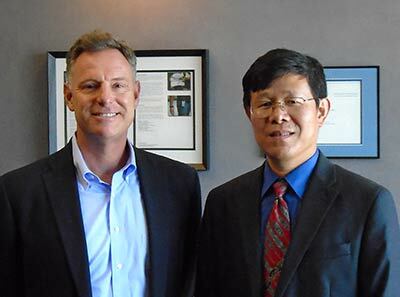 This image shows Rep. Peters with QFS CEO Dr. Yongming Zhang. More images can be seen on Rep. Peters Facebook page. QFS presents three papers at the International Lightning Detection Conference (ILDC) held in our home city of San Diego, CA. Please check out "On the Value of Using a 3-axis EB Vector Sensor for Lightning Geolocation", "Small UAV Airborne Electric Field Measurements," and "On the Spatial Structure of Electric Fields Generated by Clouds with Simple Charge Structures" here. QFS conducts a successful test of its blast detection technology. Under DARPA funding, QFS is researching its sensors' potential to detect the initial blast of an explosion to provide a trigger for deploying mitigations for the more damaging pressure wave that follows. QFS performs a successful demonstration of its gunshot detection technology for the project sponsor at a San Diego firing range. Read about the system here. QFS conducts a successful demo of its HF band (2 MHz – 30 MHz) Airborne Direction Finding and Geolocation technology, achieving real-time geolocation of Push-to-Talk radios from an airborne platform. Read about the technology here.